Up up and away! In honour of Ottawa Comiccon (May 13 to 15), Ottawa Magazine pulls back the mask on the city’s own comic book gurus. A: I would be Wonder-Wig and have the power to transform lives by using my extraordinary coiffing abilities to give everybody a good hair day. Q: If you could have a secret superhero lair somewhere in Ottawa, where would it be and why? A: Not the Diefenbunker… too obvious. My secret superhero lair would be nestled under Billings Estate. That way, my ultra-modern lair (and salon) would be topped by a stately Wayne Manor-ish building so I could emerge in my secret identity to enjoy a lovely tea. Q: Which of your own comic creations are you most proud of? A: I am most proud of Eternal Romance, a supernatural romance series that I self-published from 1997-1999 under my Best Destiny imprint. The series was collected in 2000 as the Eternally Yours: Illustrated Stories of Eternal Romance trade paperback. 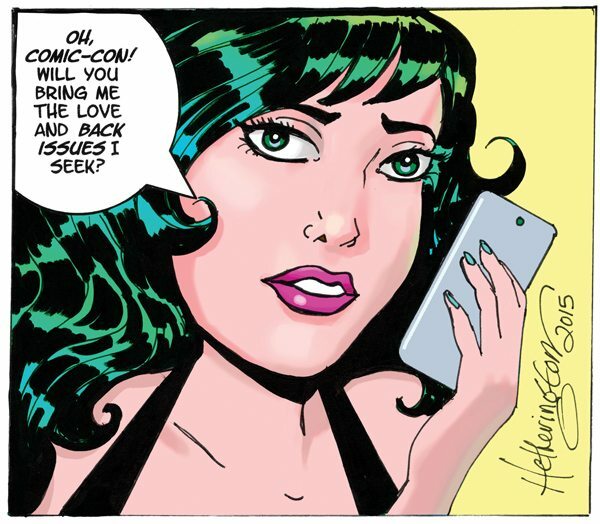 I always wanted to do romance comics and stories that appealed to girls, but there was little opportunity with superheroes dominating the market. Eternal Romance features a lovelorn vampire named Destine who, along with her wise-cracking cat named Ankh, recounts (sob!) dating horror stories. Eternal Romance will celebrate its 20th anniversary in 2017. 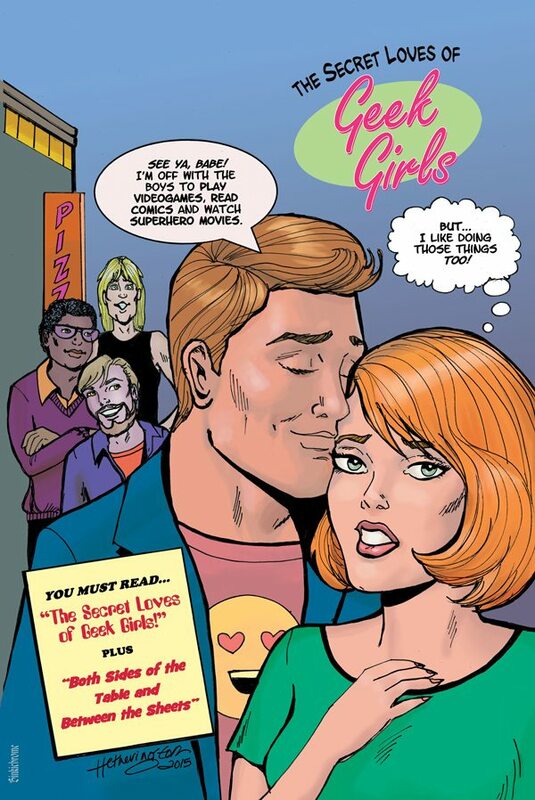 Runner-up: My contribution to The Secret Loves of Geek Girls (published by Hope Nicholson’s Bedside Press in December 2015, with a reissue by Dark Horse Comics in October 2016). Some people call this piece my “origin story.” I am proud of the fact that my artwork was featured in a New York Times Online article about the anthology. Q: Who are your favourite homegrown Ottawa comic book artists? A: This is a trick question! Most of the artists living and working in the Ottawa area are originally from away (myself included). However, here are my hometown heroes. They inspire me because they are so passionate about their work, and against all odds they choose to pursue it in Canada’s capital. 1) Ronn Sutton – Ronn is a great artist, and frequent collaborator. Sorry girls, he’s taken (by me). 2) Geof Isherwood – Geof is another great artist who also teaches his craft at Algonquin College. 3) Jack Briglio – Jack is a writer who collaborates on the True Patriot Canadian comic series and created the Eisner-nominated fantasy adventure series Growing Up Enchanted. The Eisners (Will Eisner Comic Industry Awards) are the Oscars of the comic book industry. 4) Jay Odjick – Jay is a writer, artist and television producer from the Kitigan Zibi Anishinabeg community. He is best known for his creation Kagagi (the Raven), part of a growing number of First Nations superheroes created by indigenous writers and artists. 5) Mark Shainblum – Mark is a writer who co-created the Northguard and Fleur de Lys Canadian superheroes. Mark recently co-edited Superhero Universe: Tesseracts Nineteen. 6) Brett Kelly – Brett is a writer and movie director with deep roots in comics. His rom-zom-com film My Fair Zombie has been adapted for the musical stage and will appear live at the Gladstone Theatre from May 4 to 7, 2016. The My Fair Zombie theatre poster features artwork by Ronn Sutton. Janet Hetherington is a guest at Ottawa Comiccon.